1. 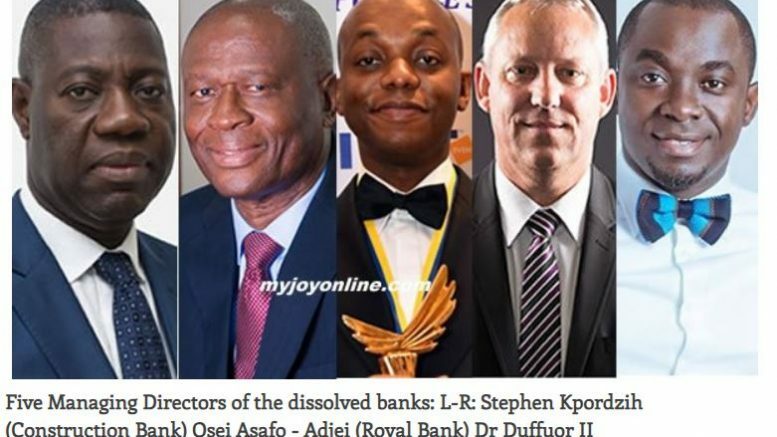 Major shakeup in Ghana’s banking industry as Bank of Ghana revokes the licences of uniBank Ghana Limited, The Royal Bank Limited, Beige Bank Limited, Sovereign Bank Limited, and Construction Bank Limited and has appointed Mr Nii Amanor Dodoo of KPMG as the Receiver for the five banks. 2. The central bank has, in turn, granted a universal banking licence to Consolidated Bank Ghana Limited established by the Government to consolidate the five banks (Beige, Construction, Royal, Sovereign and Unibank) as part of efforts to restore confidence and trust in our banking system, and to protect depositors and jobs. 4. The Government says it has also provided financial support through the issuance of a bond in the amount of GHS5.76 (USD1.25) billion towards the Purchase and Assumption Agreement under which the Consolidated Bank Ghana Limited has acquired [all deposits and other specified liabilities, and good assets of the five banks]. This will have a major impact on public debt and fiscal management. The Central bank has already said it made a loss of GHS1.6 billion last year from making similar provisions from UT Bank and Capital Bank P&A agreements. 5. The announcement follows Bank of Ghana governor Ernest Addison’s 24 July monetary policy committee communique that only 15 of Ghana’s 34 banks are set to meet the GHS400million (USD88 million) new minimum capital requirement by December 2018. 6. BoG Governor says the 3 Banks obtained licenses under false pretence, 2 others beyond savings. 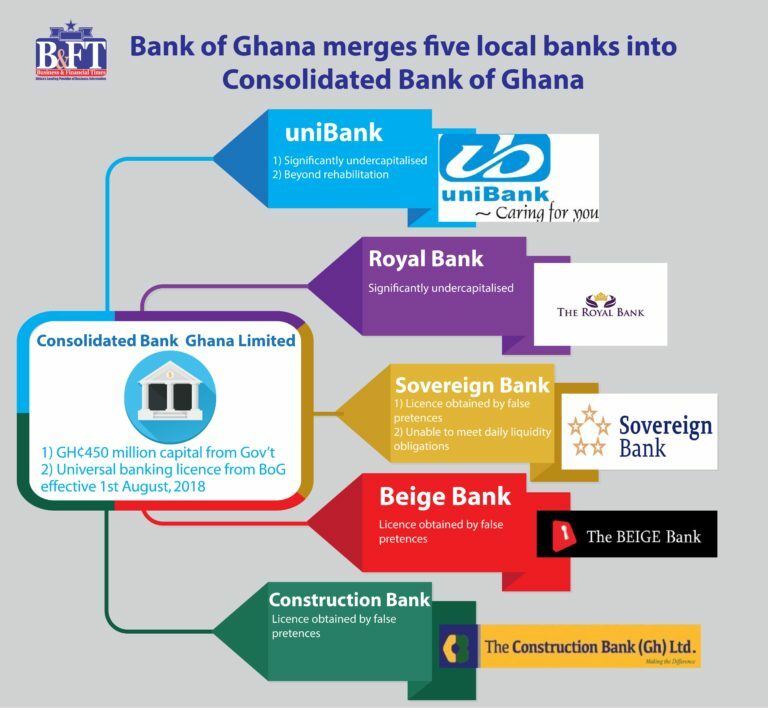 BoG says Beige Bank, Construction and Sovereign Bank’s licenses “was obtained by false pretences through the use of suspicious and non-existent capital; “uniBank and Royal Bank were identified during the asset quality review exercise in 2016 to be significantly undercapitalized. Are we thus looking at the prospect of sanctions and prosecutions for shareholders and management after investigations?